Where's your global warming now? Antarctica has actually been gaining ice for years. There's a difference between sea ice and land ice. Antarctica's land ice, or glaciers, have been melting at an alarming rate. To understand what’s going on with the ice in Antarctica, it’s important to know the difference between sea ice and land ice. Sea ice is frozen, floating seawater, while land ice (called glaciers or ice sheets) is ice that has accumulated over time on land. Overall, the Antarctic sea ice has been stable (so far) — but that doesn’t contradict the evidence that our climate is warming. Meanwhile, the ice sheet that covers most of Antarctica has lost more than half a trillion tons of ice in recent years. When land ice melts, meltwater flows into the ocean, contributing to sea level rise. Antarctica's melting land ice poses a direct threat to the hundreds of millions of people living on islands and near coasts. In glaciology and particularly with respect to Antarctic ice, not all things are created equal. Let us consider the following differences. Sea ice in Antarctica forms in salt water primarily during the winter months, then melts in the summer. Antarctic land ice is the ice which has accumulated over thousands of years on the Antarctica landmass through snowfall. This land ice, therefore, is actually stored ocean water that once fell as precipitation — and when it melts, it contributes to global sea level rise. 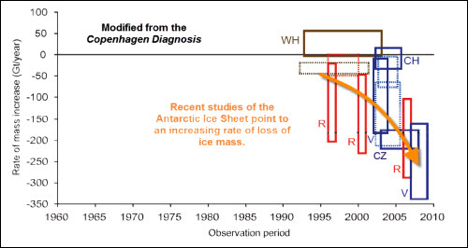 Estimates of recent changes in Antarctic land ice (Figure 2) range from losing 100 Gigatons/year to over 300 Gigatons/year. Because 360 Gigatons/year represents an annual sea level rise of 1 mm/year, recent estimates indicate a contribution of between 0.27 millimeters/year and 0.83 mm/year coming from Antarctica. There is of course uncertainty in the estimations methods, but multiple different types of measurement techniques (explained here) all show the same thing, Antarctica is losing land ice as a whole, and these losses are accelerating quickly, contributing to global sea level rise. Figure 1: Estimates of Total Antarctic Land Ice Changes and approximate sea level contributions using many different measurement techniques. (CH = Chen et al. 2006, WH = Wingham et al. 2006, R = Rignot et al. 2008, CZ = Cazenave et al. 2009 and V = Velicogna 2009). Adapted from I. Allison, N. L. Bindoff, R. A. Bindschadler, P. M. Cox, N. de Noblet, M. H. England, J. E. Francis, N. Gruber, A. M. Haywood, D. J. Karoly, G. Kaser, C. Le Quéré, T. M. Lenton, M. E. Mann, B. I. McNeil, A. J. Pitman, S. Rahmstorf, E. Rignot, H. J. Schellnhuber, S. H. Schneider, S. C. Sherwood, R. C. J. Somerville, K. Steffen, E. J. Steig, M. Visbeck and A. J. Weaver, The Copenhagen Diagnosis, 2009: Updating the World on the Latest Climate Science (Sydney, Australia: The University of New South Wales Climate Change Research Centre, 2009).